This was not fun, I thought, as I glanced woozily up at my teacher, Blaze, a strict fire faerie with short red hair. I was lying on the floor in the middle of a courtyard, rubbing my leg, after crashing for a fifth time. "Up you get," barked Blaze. "Try again!" I struggled to my feet, and began beating my wings furiously. "That's it," yelled Blaze. "Now jump!" I launched myself into the air, still beating my wings hard, and felt a brilliant thrill in the pit of my stomach as I slowly rose up and up and up. I'd never got this far before. This feeling was worth the bruises! I flew so high I went out of the top of the courtyard, and landed on the roof of the palace. A second later, Blaze caught up with me, landing on the roof. "Well done, Simma," she said. "You're certainly progressing. We can start doing long-distance and stunts now." I wasn't so sure about that. "Wh - what do stunts involve?" I asked hesitantly. "Oh, somersaults, loop-the-loop, corkscrews, dives, y'know," replied Blaze airily. And then, without warning, her wings began beating and she launched herself into the air, and executed four perfect somersaults, one after the other, with her knees tucked tight to her chest and her orange skirt flapping in the breeze. She flew gracefully down to land, and grinned at me for the first time. "We'll have you doing that in no time," she said. "So. Fly up." I beat my wings hard and fast, and was soon hovering steadily above the roof. "Now," said Blaze, "kick hard with your legs and curl into a ball." I kicked - curled - "OUCH!" I had hit the floor hard, out of control. "No problem," said Blaze. "When at first you don't succeed, try, try again." That was exactly what I did. I hovered, kicked like a Peophin launching itself out of the ocean, and at once leaned right forward and curled into a ball. I wobbled to one side, managed to regain control, and stayed up again. At the end of the day, as the sun sunk lower into the sky giving it a ruby red glow, I sank into my bed with relief. I was completely shattered after the day's work, but I had finally managed to do three somersaults in a row. Over the next three weeks, I learnt to do six somersaults in a row, loop-the-loop (which is much, much harder than it looks), corkscrew (which means spinning very fast at a horizontal line to the ground), and to dive very fast. Diving is absolutely nerve-wracking. You have to go up so high you can hardly see the ground, then point your head down, and then stop beating your wings. You drop like a stone, and the ground gets closer... closer... closer... and just about a metre from the ground you open your wings and beat them as fast as you can to slow down - but if you miss, well, I'll just say it's messy. FFFFfffffwwwooooooossshhhhhh! An enormous inferno of raging fire burst from my hands, scorching the pile of wood in front of me. This was so cool! But... really, really tiring! I felt my arms turn to jelly as the strength was sucked out of me. I dropped my orange-glowing hands to my waist, and the flames began crackling on their pile of wood, no longer streaming from my hands. I felt the waves of power that washed over me every time I did magic fade. "No, no, no!" came a voice. Blaze was hovering above me, a scowl twisting her face. "You have to keep it going for longer!" "How can I keep it going? It's really tiring!" I yelled back. "One word - practice, persevere," Blaze cried. "That's two words!" I exclaimed over the roaring of the fire. "What?" asked Blaze, screwing up her face, trying to hear. "Oh, for - " She waved a hand and the flames sizzled down to a pile of ashy logs. "As I say, the only thing that can keep it going is practice. You learn to get fit by practicing, right? It's the same with magic." I sighed. Had every fire faerie gone through this as they learned to do magic? Or did they just learn it easily and gradually, like walking or talking? Well, either way, I was finding it really, really hard. "Okay, let's do it again," said Blaze. "Concentrate... look at the logs... now imagine them burning... feel the fire building up inside you... see the flames... and let it out!" I closed my eyes and pushed the magic out, my arms at full length, my heart beating as fast as a drum. I felt the familiar warming heat in my palms, saw the orange glow, and then heard the whoosh as flames burst out of my hands. I felt a niggling tiredness creep over the edge of my happiness, and tried to stop the fire. I imagined the fire slowly sizzling out, then waved a hand like Blaze had - but all that happened was that the flames spread from my hand to my top. "Stop!" I yelled to the flames, waving my arms frantically. They evaporated into a thin stream of smoke - luckily I could control them, if not in a very dignified manner. I looked down, and my face fell as I saw a large black-edged rip along the shoulder of my top. "Aww... " I groaned. I had liked that top! "I taught you how to set quests, didn't I?" said Blaze from above. I nodded, and closed my eyes, picturing Neopia below me. I zoomed in on... let's see... the Lost Desert, and... a young green Lupe, standing outside a vegetable shop. "Simma the fire faerie has scorched her outfit. Bring her clothes with fire on, and she will increase your strength," I thought at the Lupe. He ran off to the clothes shop, sending up flurries of dust from the floor, and I opened my eyes back into Faerieland. "Oh, yeah, I forgot to tell you Queen Fyora says you must have something ready to show in the faerie festival next month. It's in Illusen's glade," Blaze called, gliding down to land. "WHAT?!" What was Fyora thinking? How could they expect me, me, a faerie who had only been a faerie for about two months, to actually make a presentation in front of practically all the faeries in Neopia? I'd seen the other fire faeries practicing - they could juggle twenty fireballs with their eyes closed, whilst looping the loop in mid-air with one wing tied behind their backs. How could I compete against that, while I couldn't even keep a pile of logs burning for over a minute? I was going to have to think about this, and think hard. I was hardly going to be able to learn to juggle fire or fly with one wing in only a month, so what could I do... ? "Okay, let's try that again," came the voice of Blaze from behind me. "We're gonna keep pushing on at this until you're perfect." As the flames burst out of my palm, I saw one of them twist away from the others. It swirled in the air for a moment, seemingly taking the shape of a fiery snake, then it evaporated into a wisp of smoke. An idea began to form, very slowly and carefully, in the corner of my mind. I left it alone for the rest of the lesson to develop, and by the time I walked back into my bedroom, three hours later, I knew exactly what I was going to do for the festival. The question was, could I pull it off? The fire twisted to the left as I leaned, following my exact movements. If I raised an arm, a burst of flame grew up higher than the rest. If I ducked down low, the fire huddled down on its pile of logs. It was all going perfectly. I jumped in the air, and the fire grew as high as me. Then I flapped my hands at the fire and hissed, "Stop!" The fire burned itself out. I had learned to control it, but it wasn't enough for what I was aiming to do for the festival. I had to be able to shape it. I sent a burst of orangey flame at the logs, which caught on fire again. First, I decided, I would learn to shape it while it was on the logs. Then, I'd learn to shape it while it was off the logs. "Okay," I muttered to myself, "I need it to become a Neopet." I slowly moved my hands and controlled the fire, a clear picture of what I wanted the flames to become in my mind. 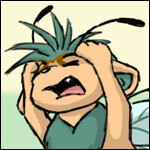 Far, far away, down on the other side of Neopia, Illusen the earth faerie was flicking through a booklet. "Let's see," she muttered, "fire juggling, tornado making, vine growing, bubbling fountains, blinding light, smothering darkness, snowstorms, neggs, cream cookies..."
She sighed heavily. "Oh, I wish someone would do something original once in a while." She turned another page, and a name she had never seen before caught her eye. "Simma Starclaw, fire faerie, surprise presentation," she read. "Starclaw...? That's a funny name for a faerie..."
She turned to the light faerie behind her who was putting up lanterns, lighting them with a single touch of her yellow-glowing fingers. "Hey, Candria, do you know anything about this Simma Starclaw?" Candria thought for a moment. "Hmmm... Actually I did hear a rumour from the palace, a couple of months ago," she said thoughtfully. "Did you ever hear of Syntai's Spell?" "Oh, yes, the door thing on Mystery Island," Illusen replied. "Go on." "Well apparently this Simma used to be a Kougra! And she went through the door and became a fire faerie! Fyora's being very nice to her, of course, giving her lessons and everything. Poor thing, it must've been a big shock for her." "And she's performing at the festival, without having been a faerie for even four months?" said Illusen, surprised. "I'd keep myself to myself, if it was me." "Well, yes, so would I," replied Candria. "But maybe she's quite good and wants to show it. Or maybe someone made her." Illusen nodded. "Well, I'll be keeping an eye on her when the day arrives."